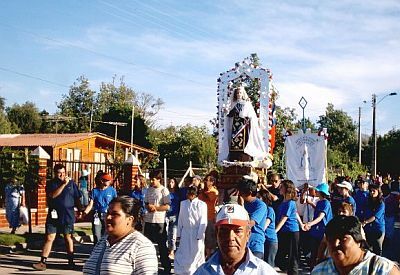 La Fiesta de La Virgen del Carmen, or the Fiesta of the Virgin of Carmen. The Virgin of Carmen is more correctly known as Nuestra Señora de Monte Carmelo, which alludes to Mount Carmel and is one of the many manifestations of the Virgin Mary. This particular Virgin Mary was adopted by fishermen and sailors as their patron saint and, as a result, the ceremony and fiesta of the Virgin of Carmel is an important occasion throughout Spain in coastal towns where maritime activies are important. The procession occurs on the 16th of July and is a particularly good one in the Tenerife towns of Puerto de La Cruz, Los Realejos, Playa San Juan, Puerto de Santiago, Las Galletas and Los Cristianos. 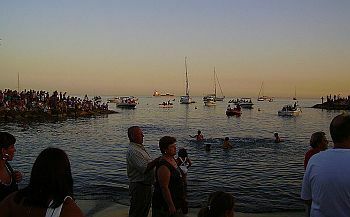 Images of the Virgin of Carmel are paraded through the town and the procession makes its way down to the sea. There, the Virgin is placed aboard a boat, which is then set afloat. The procession (or, some of them) follow it into the sea. Thereafter, as you might expect, there are amazing firework displays.